Ganesh chaturthi is one of the grandest and most elaborate festivals that Indians celebrate. Especially in the state of Maharastra. 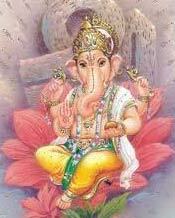 Ganesh Chaturthi is the Birthday of Lord Ganesha. Ganesh chaturthi is celebrated for 10 days. It begins on the fourth day of shukla chaturthi and ends on the day of ananta chaturdashi. The power of Lord Ganesha is invoked on the first day; worshipped elaborately in decorated pandals for 9 days; and on the tenth day he is bid farewell by immersing in water bodies. The festival of Ganesh Chaturthi is celebrated the states of Maharashtra, Tamil Nadu, Karnataka and Andhra Pradesh and many other parts of India. Started by Chatrapati Shivaji Maharaja, the great Maratha ruler, to promote culture and nationalism, the festival was revived by Lokmanya Bal Gangadhar Tilak to spread the message of freedom struggle and to defy the British who had banned public assemblies. The festival gave the Indians a feeling of unity and revived their patriotic spirit and faith. This public festival formed the background for political leaders who delivered speeches to inspire people against the Western rule. The festival is so popular that the preparations begin months in advance. Lord Ganesha statues installed in street corners and in homes, and elaborate arrangements are made for lighting, decoration, mirrors and the most common of flowers. Pooja (prayer services) are performed daily. The artists who make the idols of Ganesh compete with each other to make bigger and more magnificent and elegant idols. The relevantly larger ones are anything from 10 meters to 30 meters in height. These statues are then carried on decorated floats to be immersed in the sea after one, three, five, seven and ten days. It is forbidden to look at the moon on that day as the moon had laughed at Ganesha when he fell from his vehicle, the rat. 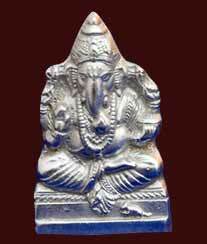 With the immersion of the idol amidst the chanting of "Ganesh Maharaj Ki Jai!" (Hail Lord Ganesh). The festival ends with pleas to Ganesha to return the next year with chants of "Ganpati bappa moreya, pudcha varshi laukar ya" (Hail Lord Ganesh, return again soon next year).